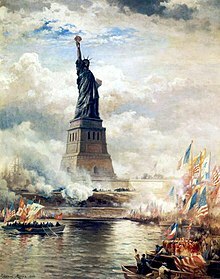 Unveiling of the Statue of Liberty Enlightening the World (1886) de Edward Moran. Oleo sur tolo. J. Clarence Davies Collection, Muzeo de la Urbo Novjorko. Edward Moran (19an de aŭgusto 1829 en Bolton, Lancashire, Anglio – 8an de junio 1901 en Novjorko) estis usona artisto ĉefe pri primaraj pentraĵoj. Li famiĝis ĉefe prr sia serio de 13 historiaj pentraĵoj pri la marhistorio de Usono. Ĉi tiu paĝo estis lastafoje redaktita je 15:16, 26 jan. 2019.